Today the Town of Peace River joins with millions of Canadians in remembering the events of April 9, 1917. Flags at municipal facilities have been lowered for the day to commemorate the approximately 170,000 soldiers who took the ridge at a cost of 3,598 dead and 7004 wounded. We are commemorating not only the success and the toll of that battle but also the historical significance of the engagement. 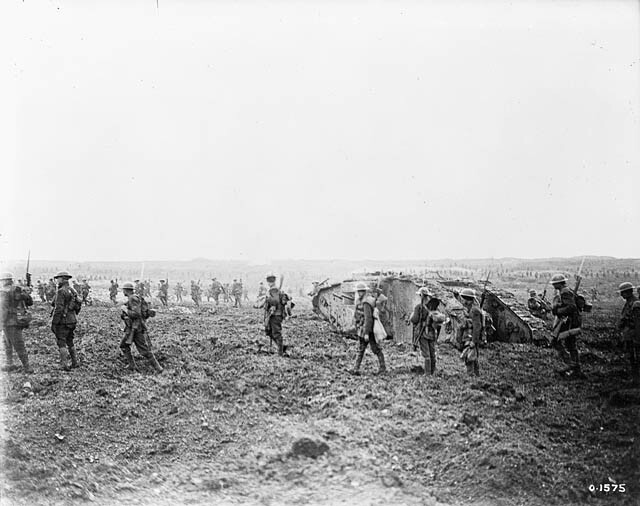 Canadians advancing with a tank over “No Man’s Land” at Vimy Ridge, April 1917. Courtesy of Department of National Defence. Library and Archives Canada. Canada entered World War One as little more than an English colony. By the time the Treaty of Versaille was signed in 1918, Canada had earned its own signature line. While Canada had been independent for almost 50 years when war broke out, Vimy was the start of a series of battles in which the young state of Canada distinguished itself repeatedly on the international stage. Additionally, it was the first combined battle that included all four divisions of the Canadian Expeditionary Force. To commemorate the centennial of the First World War the Government of Canada has been updating their website with all kinds of never before seen records and archival material. At the time war broke out Peace River was a tiny settlement called Peace River Crossing. While there are no records of anyone who was born in Peace River, there are eight who enlisted in Peace River. To search the records yourself you can access the database here. Take a moment to reflect today on the world that was 100 years ago.